You can read Part 1 of our recent Hawaiian birding adventure here. After two busy days of birding and setting up shop, Jody Allair and I greeted our Eagle Eye tour group on the evening of Wednesday, March 12. Our crew for the next eleven days consisted of a dozen wonderful people from Ontario, British Columbia, Washington, Michigan, and Japan. 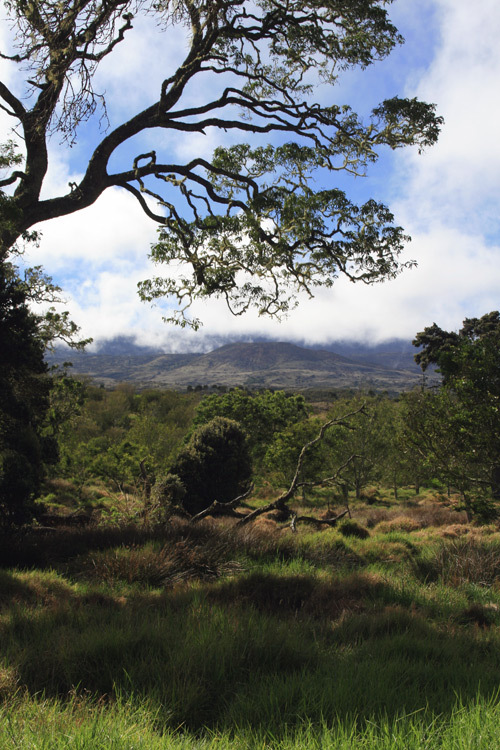 A view of Hakalau Forest, with a large ohia lehua looming in the foreground. Our exploration of Hawaii kicked off the next morning with a visit to one of Big Island’s most special and protected places – Hakalau Forest National Wildlife Refuge on the eastern (windward) slopes of Mauna Kea. The ancient Hawaiian name Hakalau means “many perches”, reflecting its importance both as bird habitat and in their traditional culture. Since the refuge area is managed and protected by the U.S. Fish & Wildlife Service, we visited with Hawaii Forest & Trail – a great local company with exclusive rights to bring tours into this and wonderful place. Our guide for the day was Gary Dean, who is not only intimately familiar with the birds of Hakalau, but also Canadian transplant! Our first bird stop along the Saddle Road gave us great looks as several Chukar – another introduced game bird that has become well established in the area. A short while later, we were thrilled with excellent views of Pueo (Short-eared Owl) which is native and thought to have colonized the islands after the arrival of the Polynesians. After flying around for a minute or two, this beautiful owl perched right alongside the road to give us incredible views! The rest of the drive offered roadside views of other great birds such as Pacific Golden Plover, Erckel’s Francolin, and Ring-necked & Kalij Pheasants. 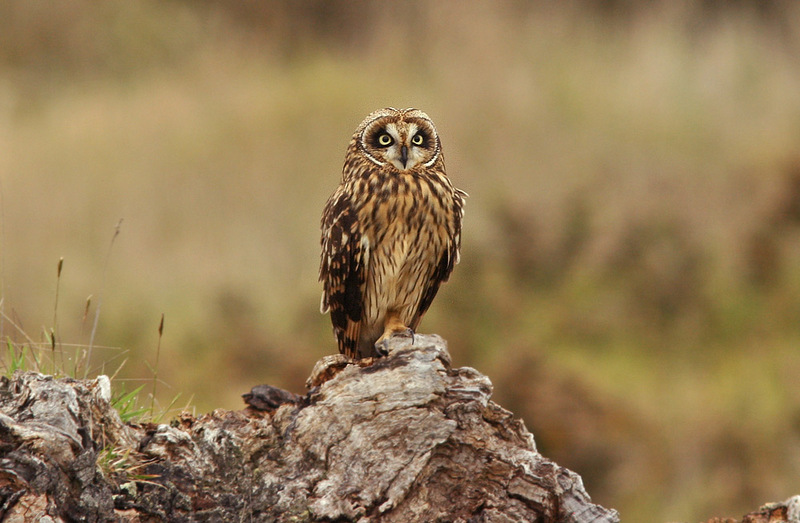 The Pueo is a native subspecies of Short-eared Owl and has a special place in traditional Polynesian culture and stories. This one posed for looks on the eastern slopes of Mauna Kea. 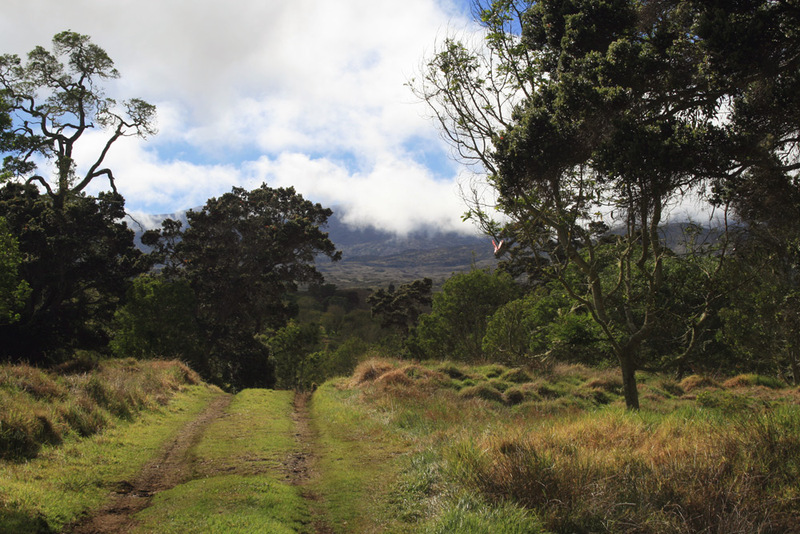 I was immediately struck by the lushness of Hakalau Forest as we pulled into the parking area … the hillsides were vibrant with stands of ohia, koa and other large trees. While this forest is home to one of the most intact native forests in Hawaii, it didn’t take long to spot introduced and alien plants lurking in the understory – due mainly to the area’s history as a large pastureland. Fortunately, the predominate bird species in this area were also native, with impressive numbers of Iiwi, Apapane and Hawaii Amakihi calling and foraging throughout our hike. We were extremely fortunate with great views of several Omao – one of just two native thrushes left in Hawaii. Introduced songbirds were relatively scarce in this forest, with just a handful of Japanese White-Eye, Red-billed Leiothrix and House Finch being seen during our several hour walk. 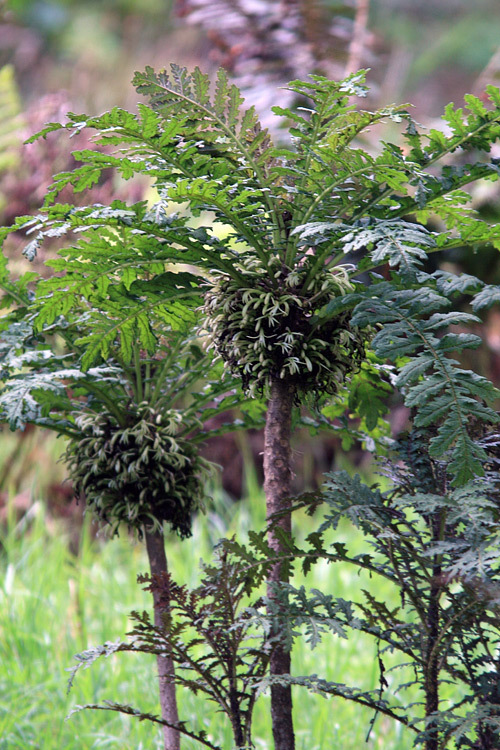 Hakalau Forest is also home to some of the rarest plants in the world, and we were fortunate to see several of them, such as the very endangered lobelias Shipman’s Cyanea (Cyanea shipmanii) and Hillside Clermontia (Clermontia lindseyana). We also encountered several of Hawaii’s intriguing “mintless” mint plants, which evolved to suit their formerly safe island ecosystem. Haha/Shipman’s Cyanea (Cyanea shipmanii) is one of several very rare and endangered lobelia species in Hawaii. Their unique flower shapes have evolved along with the long-billed honeycreepers, many of whose own recent extinction have spelled doom for the plants which relied on them for pollination. Nature can be at once amazing and sadly vulnerable. Giant mint (Phyllostogia brevidens) is a very rare endemic plant that is extinct in the wild, occurring now only where replanted. 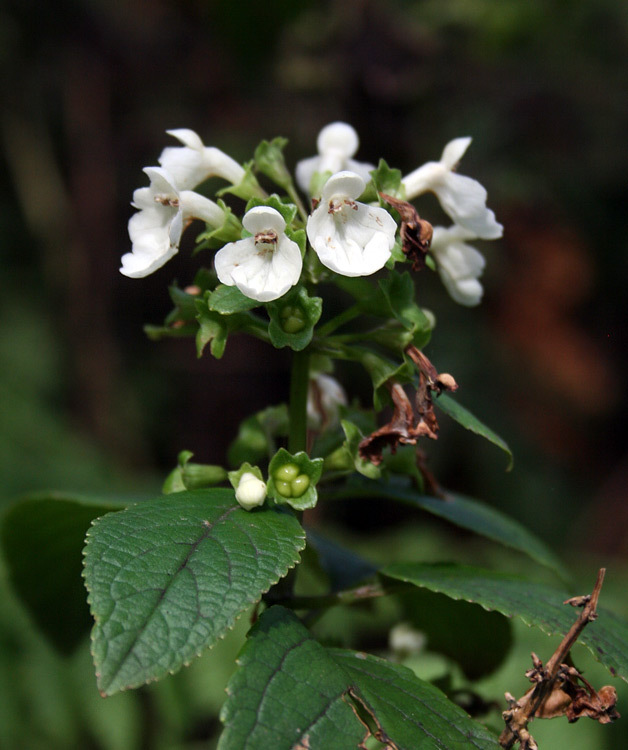 Several species of mint in Hawaii have evolved without the characteristic mint flavour/aroma since it offered no survivial advantage in the absence of native herbivores. This has since proven to be a deadly adaptation, with introduced animals like feral pigs having decimated many populations. Despite the poor photos, we had quite good looks at this otherwise skulky Hawaiian Creeper. One of the dullest honeycreepers, it is designed to be secretive. Our key bird targets for this day included two rare honeycreepers that are restricted to these native old-growth forests. We scored our first early on – a very skulky Hawaiian Creeper foraging quietly along the hidden inner branches of a koa tree. Incredibly, we ended up seeing or hearing a total of five including two attending a nest – possibly one of the rarest observations of the entire tour!! We soon nailed our second target species, although it was a little less cooperative … an Akepa was seen feeding high up in the canopy of an ohia tree, often hiding amongst the leaves and against the bright sunlight. Another was seen by just a few members of the group, and a third was heard singing. Two I’o (Hawaiian Hawk) circled over our picnic spot, while several Hawaii Elepaio (“volcano” race) were found frolicking from branch to branch in their typical style. All in all, it was awesome birding and a fantastic day in one of Hawaii’s most pristine forests! A beautiful, birdy hike through Hakalau Forest made for an awesome first day of our Hawaiian adventure. With one fantastic day and several amazing birds already under our belt, we headed back to Mauna Kea the following morning (March 14) – this time to the drier western slopes and the home of another very rare honeycreeper. The mamane-naio forest of Puu La’au is one of the best places to see Palila – a critically endangered species that feeds almost entirely on the green seed pods of mamane trees. We were very fortunate to have one of the birds, the last remaining “grosbeak honeycreeper” of Hawaii, fly across the road in front of our vans on the drive up. It landed right alongside the road, allowing almost the entire group some very good looks before it disappeared a few minutes later. We continued up to an elevation of ~7500′ where Jody and I had seen a pair just two days prior, hoping for even more. Unable to see or hear any after a 20 minute stroll, we were headed back to the vehicles when one of our participants picked up on one flying in … and suddenly there were four!! Although they were never close enough for great photos, they did obligingly sit still long enough for everyone to get wonderful scope views. Seeing five of these incredibly threatened birds was awesome – and a highlight that would be hard to beat. The Palila is one of the most endangered birds in Hawaii, with its entire population living in an area on the western slopes of Mauna Kea that can be seen in one panoramic view from the Saddle Road. 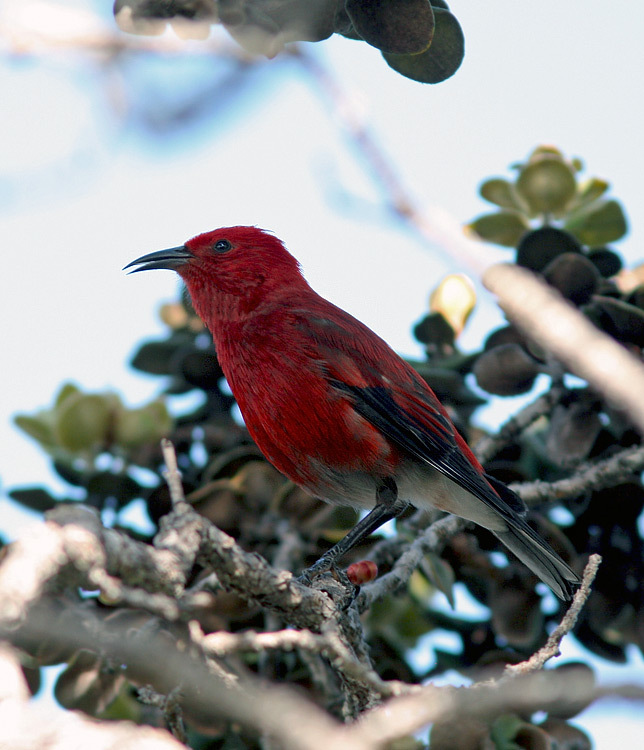 All the other “grosbeak honeycreepers” of Hawaii have already become extinct. 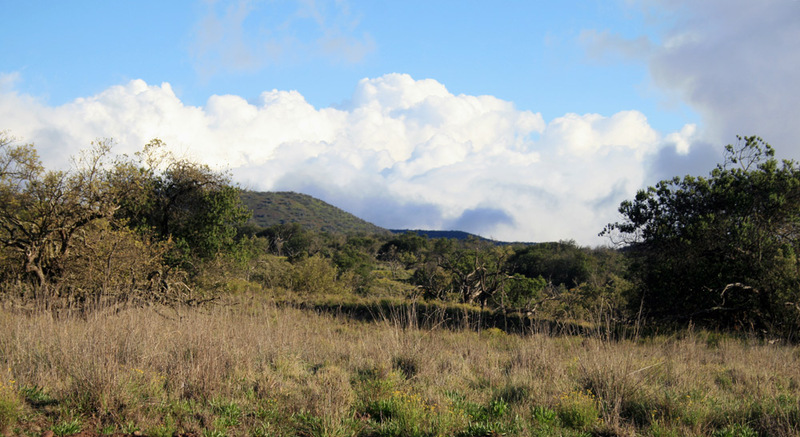 The forests on the western slopes of Mauna Kea are relatively dry and predominated by native mamane, naio and endangered sandalwood trees. 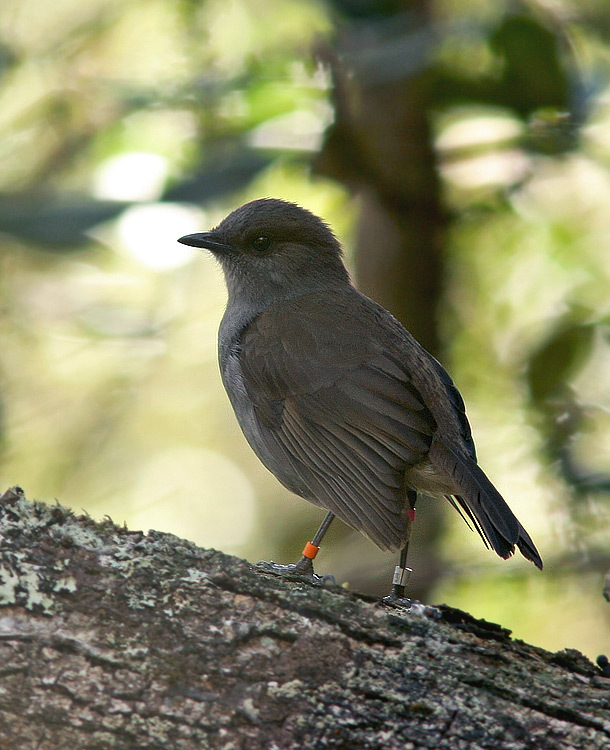 These mamane-naio forests host one of the densest populations of Amakihi in Hawaii, and their nasal calls were a constant reminder of that. The pale, frosty “Mauna Kea” race of Hawaii Elepaio also lives here. We were lucky enough not only to see a pair of this classy little bird but also found a nest they were building high up in a naio tree. Several Wild Turkeys were seen and heard during the morning, and two California Quail frolicked on the roadside during our drive down. Skylarks were plentiful in the area, entertaining us with their fluty song and peppy display flights. Apapane are perhaps the most common and widespread honeycreeper in Hawaii. These energetic, brilliant red birds occur on all the main islands. After lunch at nearby Mauna Kea State Park, part of our group hiked the Puu Oo trail in hopes of seeing another very rare honeycreeper, Akiapola’au. While they were unable to track down this hard-to-find bird, they did enjoy great looks at Iiwi, Apapane, Hawaii Amakihi, Hawaii Elepaio, and even two obliging Omao. A Red-billed Leothrix, common but often hard to see, also showed up for the party. Other members of the group who did not feel like hiking the rough trail terrain explored the roadsides near Kipuka 21 – another very birdy location that is unfortunately closed to the public. We enjoyed several flocks of Yellow-fronted Canary, dozens of Apapane and a probable Metallic Skink that slinked away before being confirmed. A rainy drive back along the Saddle Road produced a Pueo (Short-eared Owl), several Erckel’s Francolin, and an increasingly rare Japanese Quail that graced our lead vehicle (Jody, not me!!) by flying across the road. 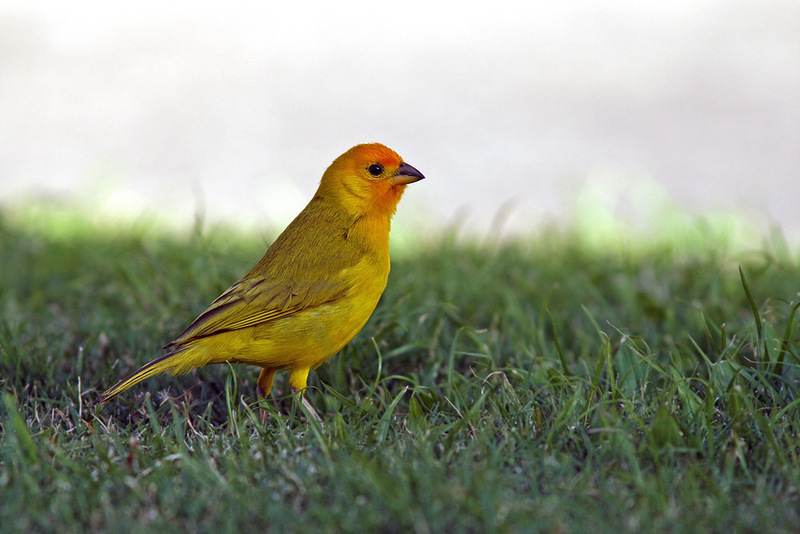 Saffron Finches, introduced from South America, add some extra colour to the Kona scenery. Our last morning in the Kona region was a little more relaxed, starting (for me at least) with a little poking around near the hotel. I especially enjoyed the Golddust Day Geckos and Green Anoles hanging out on trees and plants along the path, but also the stunning little Saffron Finches feeding in the grass. Zebra and Spotted Doves were just about everywhere, while Common Myna, Japanese White-Eyes and the occasional Java Sparrow or Yellow-billed Cardinal brightened up the scenery. 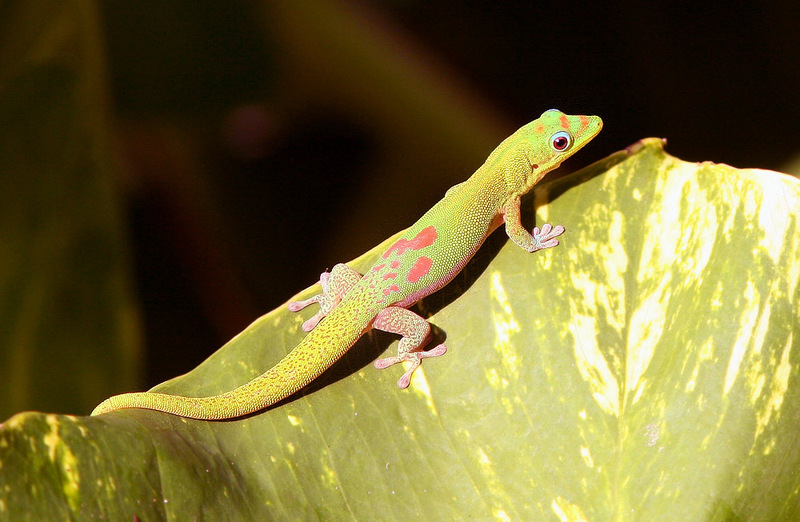 Each morning, smart-looking Golddust Day Geckos could be found sunning themselves on large leaves near our hotel. 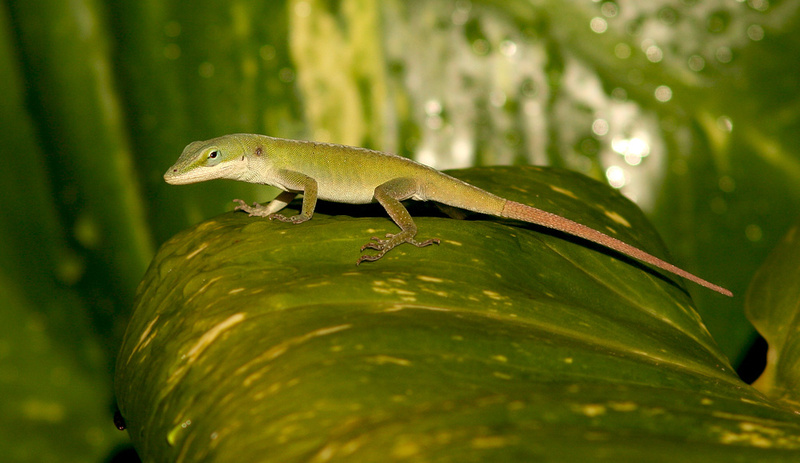 While Green Anoles actually occur in several colours, I liked these “typically” green ones best. We checked a small water drip at a local mall where songbirds often stop to drink & bathe, finding little activity outside House Sparrows and several Common Waxbills. 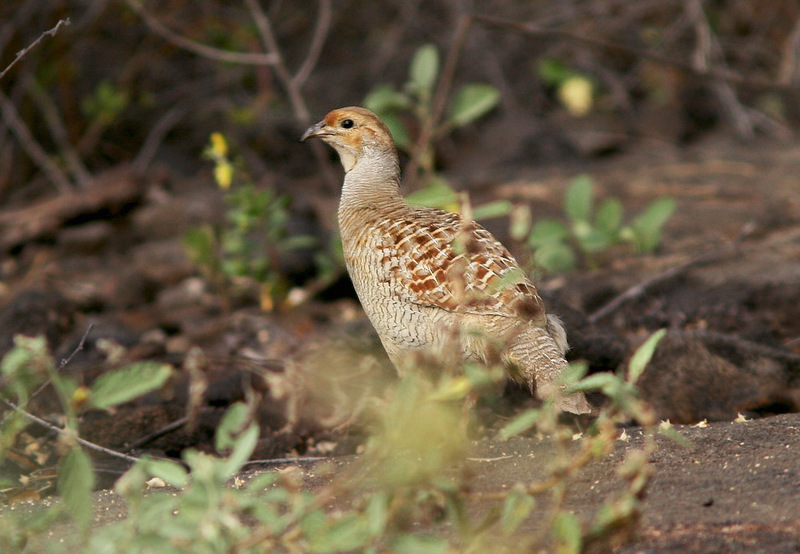 Gray Francolin were found skulking in the underbrush along the trail at Honokohau Bay. From there we headed to Honokohau Bay, where the short trail to the beach produced great looks at two Gray Francolin, several Pacific Golden Plover and a Mongoose. Butterflies included Cabbage White, Large Orange Suplhur, Monarch, and Gulf Fritillary. Along the shoreline we enjoyed a handful of Wandering Tattlers, Ruddy Turnstones, and a single Sanderling. Several Green Sea Turtles were lounging in the tidal pools or on the exposed lava rock along the beach. 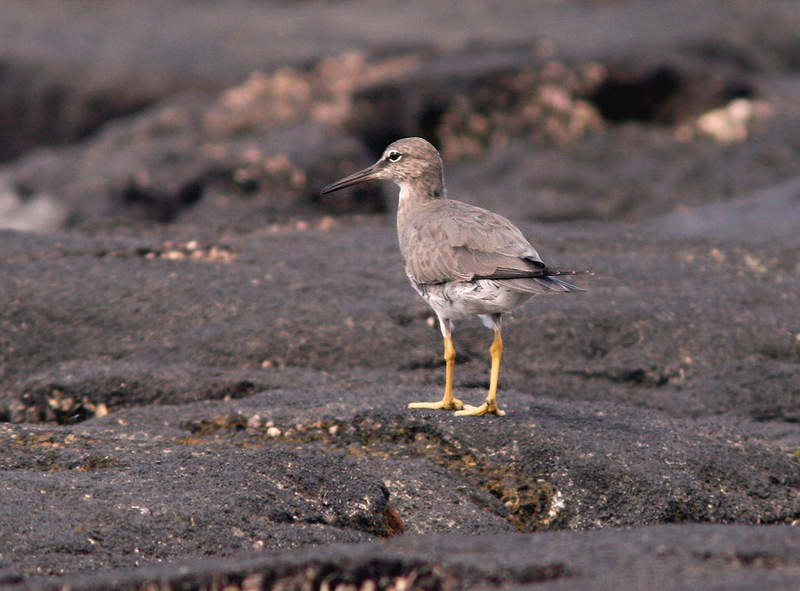 Wandering Tattlers are among the most common shorebirds in Hawaii – but still quite exciting for an east coaster like me! At Aimikapa Pond were several endemic Hawaiian Coots (Alae Ke’oke’o), Black-crowned Night Heron, and introduced Cattle Egret, along with migrant waterfowl including Northern Shoveler, Ring-necked Duck, and Green-winged Teal. Two Hawaiian Stilts were seen foraging on the far edge of the pond and large Milkfish (introduced from the Philippines) lurked in the water in front of us, their dorsal fins breaking the surface like small sharks. 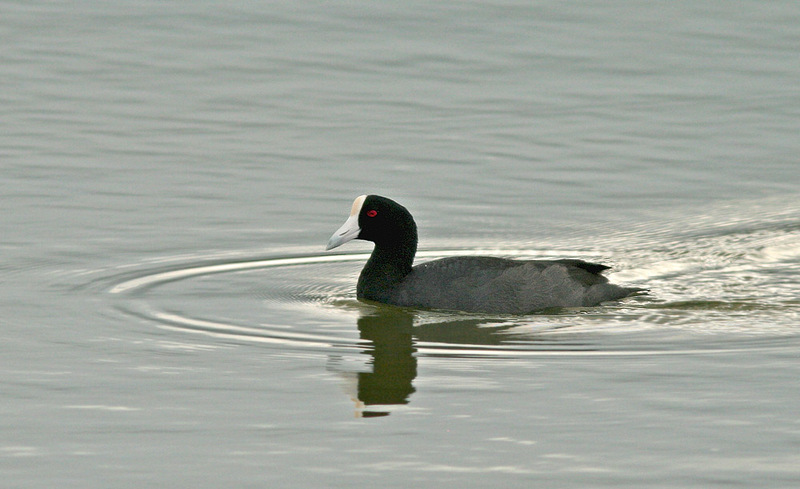 Hawaiian Coots, like this one at Aimikapa Pond, are now considered an endemic species – split from its American counterpart. Most have a fully white frontal shield, although a minority exhibit a red shield. It was time to make our first big move of the tour, driving south along the coast to our next location near Hawaii Volcanoes National Park. Along the way, we stopped for lunch at Manuka State Park, where our third race (“Kona”) of Hawaii Elepaio came out to greet us not far from the picnic area. Japanese White-Eye, Apapane, and Hawaii Amakihi fluttered around the treetops as we ate, along with a nice example of “yellow” House Finch. 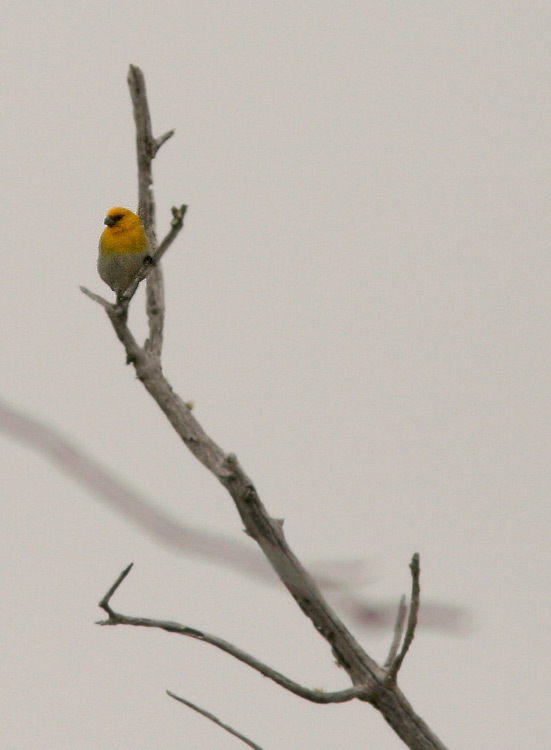 Our next stop at Whittington State Park was also quite birdy, with numerous Saffron Finch and a big flock of Nutmeg Mannikin hanging out near the parking area. The highlight, however, was a distant group of Hawaiian (Black) Noddy feeding over the rough ocean waters. We arrived at our beautiful lodgings in Volcano in time to settle in and head out for a much deserved meal. 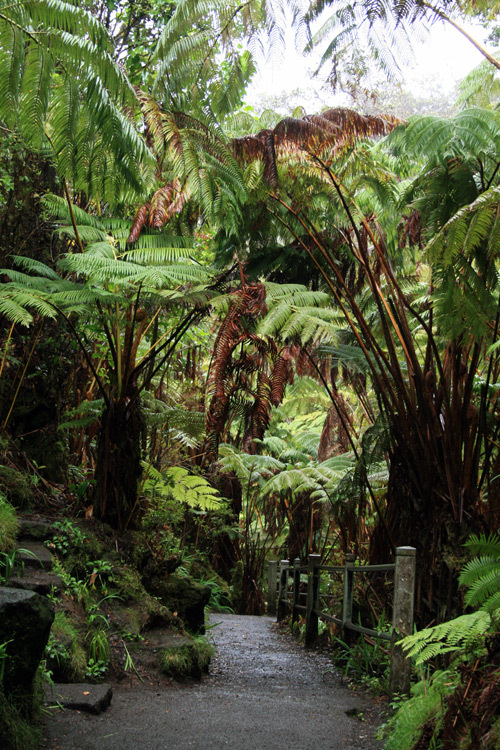 The tree fern forests of Hawaii Volcanoes National Park had a very “Jurassic Park” vibe. We started our day at Hawaii Volcanoes National Park with a visit to the famous Thurston Lava Tube – along, snaking cave that once (several hundred years ago) had red hot lava flowing through it. The lush tree fern forest surrounding the cave was alive with birds, especially Apapane which were feeding on red ohia blossoms. We were also fortunate to have an Omao fly in and land alongside the trail just metres away, stopping just long enough for us to revel in its beautiful song. Since we had arrived early and beat the usual “tourist” traffic, we were able to enjoy a quiet stroll through these very prehistoric feeling forests before heading off to our next destination. 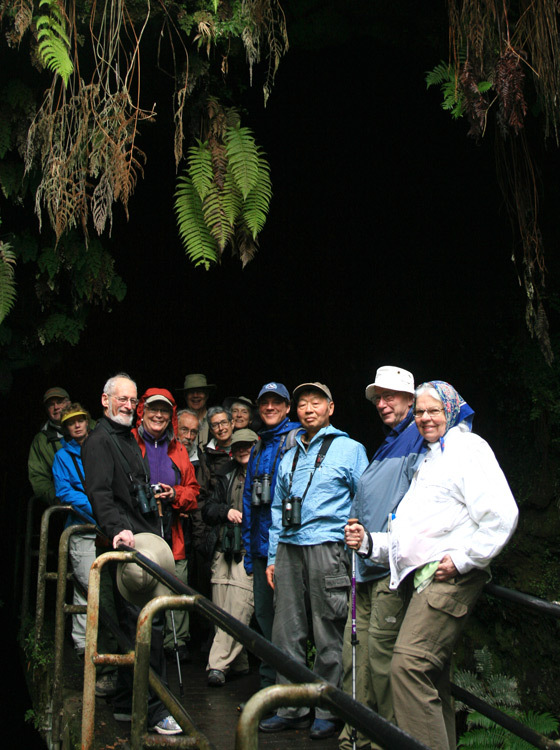 Our excellent Eagle Eye Tours group at the entrance to the Thurston Lava Tube. Heading south along the Chain of Craters Road, we drove through a series of dry, grassy forests interspersed on otherwise black, barren lava fields. It was amazing to see the vast lava flows and to imagine the eruptions that must have produced them – beautiful, frightening, creative and destructive all at the same time. 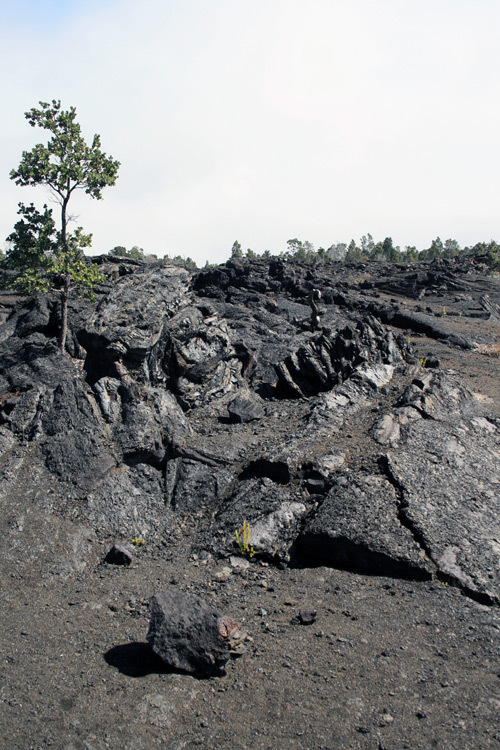 Quick stops along the road allowed us to explore the fields and see both types of lava up close – the rough, jagged “a’a” and the smoother, pillow-like “pahoehoe“. However, we soon discovered that the extremely high winds of the morning had forced a road closure, preventing us from reaching our ultimate destination at the Holei Sea Arch. The winds didn’t stop us from enjoying the view, though, as we walked down to a nearby viewpoint, braced ourselves against the railing, and gazed in awe over the stunning volcanic coastline. The stark but beautiful coastline on the Chain of Craters Road shows how various lava flows, over many years, met the ocean. We continued back along the road and visited the Jaggar Museum, which overlooks the Kilauea Caldera. We took in great views as the caldera steamed away, and even managed to spot our first White-tailed Tropicbird cruising around the edge of the crater (where, incredibly, a few even nest!). 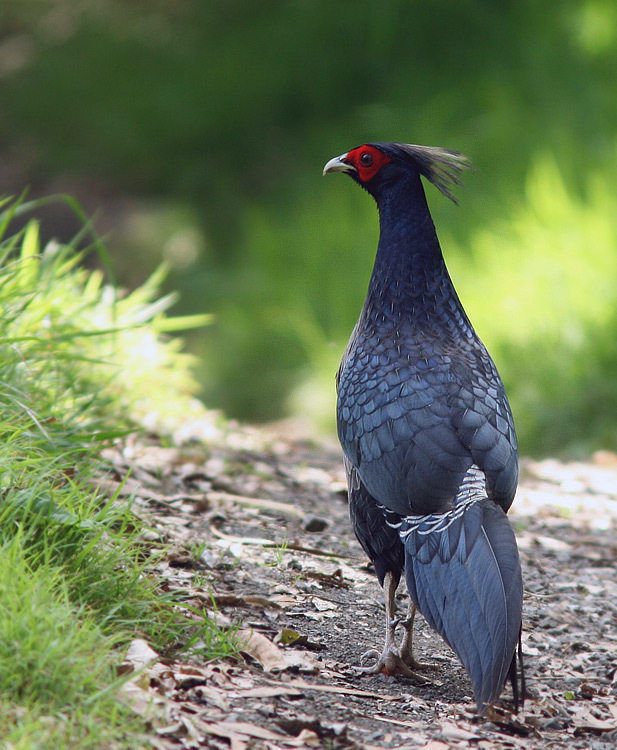 We also visited the nearby Visitors Centre, where Kalij Pheasants strutted around in full view. 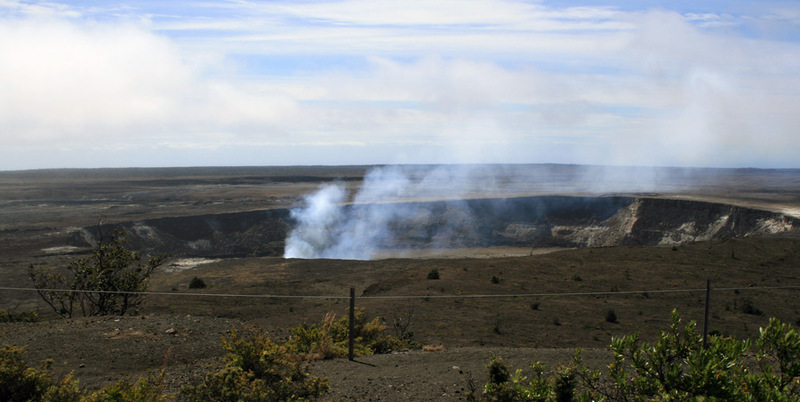 Kilauea Caldera – an active crater where lava continuously bubbles a few hundred feet below the rim. 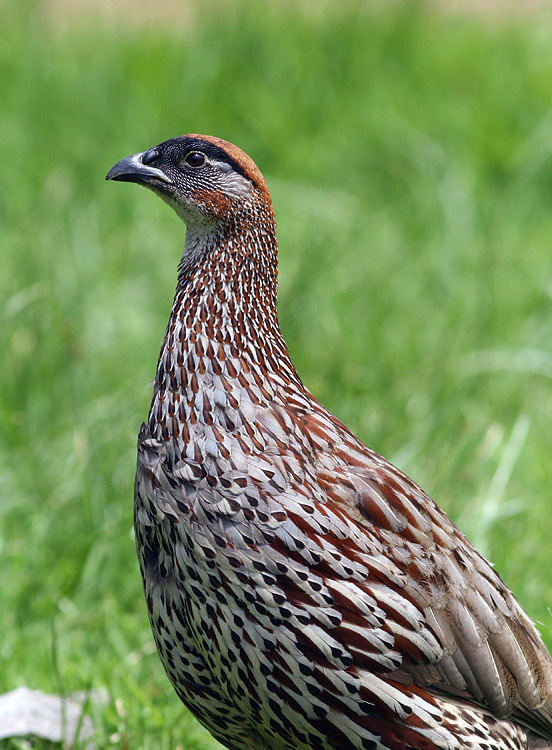 Erckel’s Francolin, introduced from Africa, are common throughout the Big Island, Kauai and parts of Oahu. Our lunch, at a lush green picnic spot on the Mauna Loa Road, proved to be another highlight of the day. We were entertained by three very friendly Erckel’s Francolin that have clearly become accustomed to people (and their food! 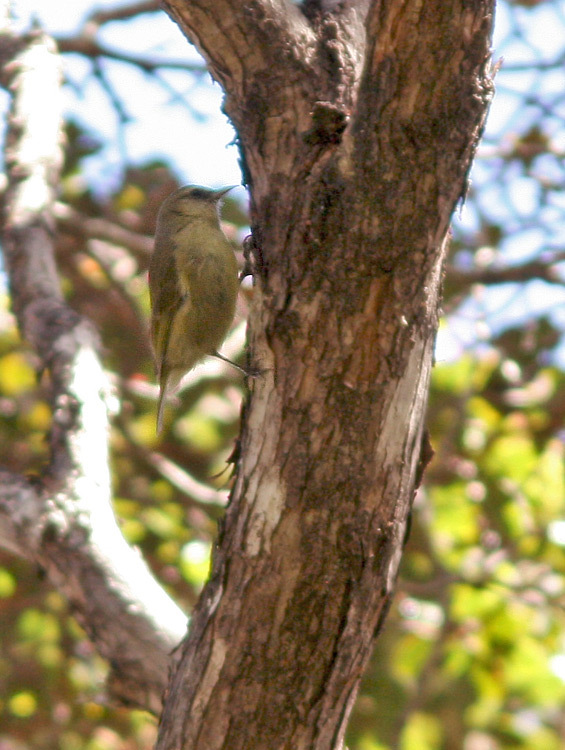 ), as well as numerous Hawaii Amakihi and Apapane hanging out in the nearby trees. 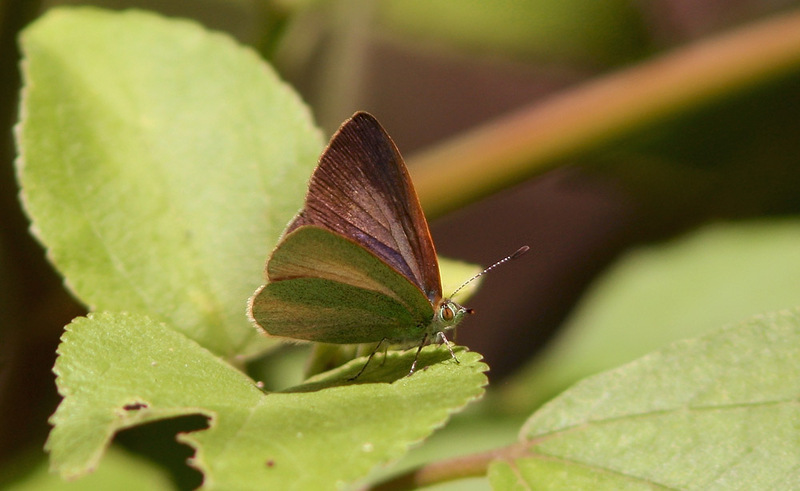 Two new butterflies were also spotted – a Long-tailed Blue (aka Pea Blue) and a female Fiery Skipper. 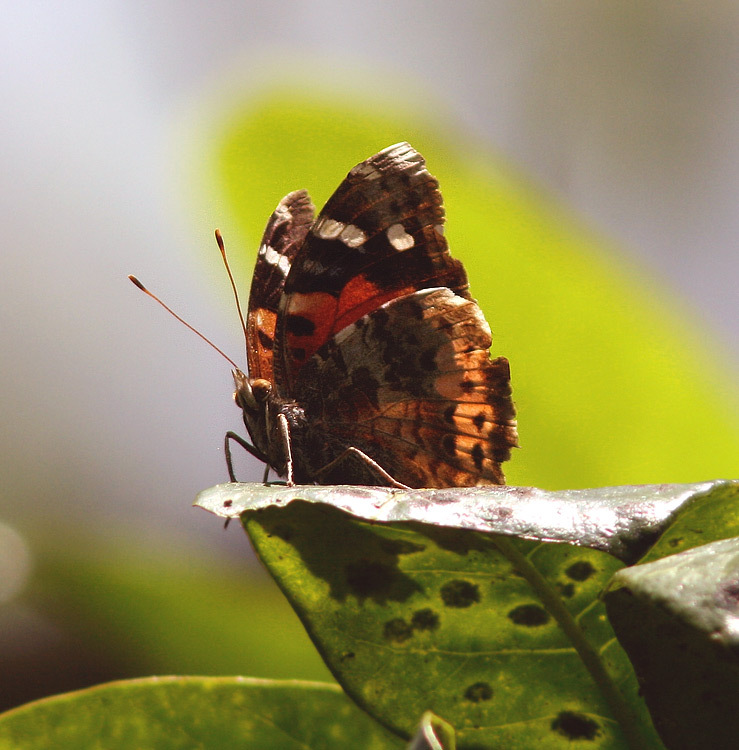 However, the best butterfly of the entire trip were discovered during our afternoon hike on the Bird Park (Kipuka Puaulu) trail, where we encountered several Kamehameha Butterflies – one of two endemic butterflies, and definitely the most flashy. I hung back to try for better photos, only to spot the other endemic butterfly – Blackburn’s Little Blue! The trail was also quite birdy, getting most of the group their first good looks at a secretive Red-billed Leiothrix. 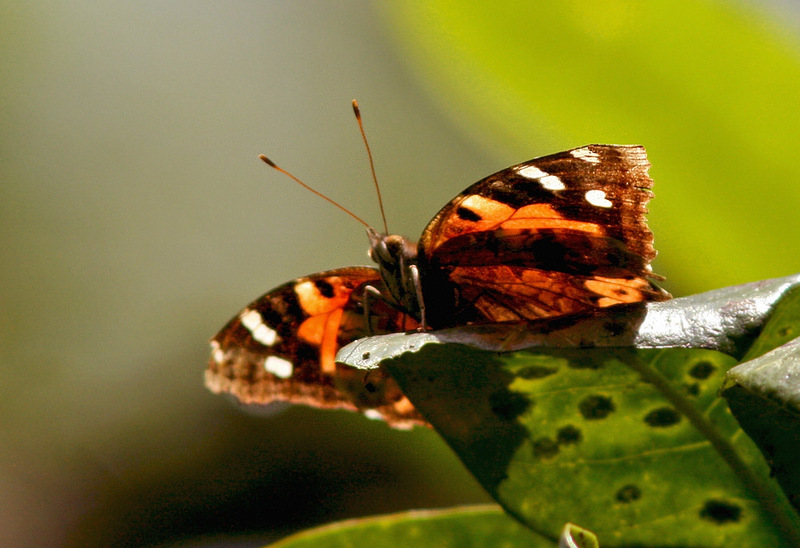 Kamehameha Butterfly is one of two endemic butterflies in Hawaii, and by far the most flashy looking. Unfortunately these individuals did not cooperate for upperwing photos. Blackburn’s Little Blue is the other, more understated of Hawaii’s two endemic butterflies. Note the irridescent green underwings – a distinguishing mark from several other species of blue that have been introduced. 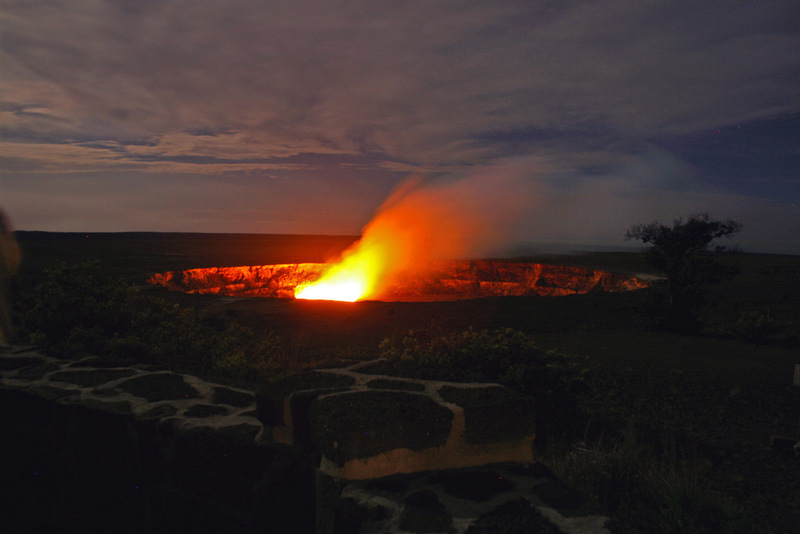 After a lovely evening meal in Volcano, we headed back to Kilauea Caldera to see the glow of lava emanating from the crater. It was pretty amazing sight, made even better by an owl soaring around the rim. We did a little morning birding around the beautiful property and neighbourhood of our accommodations in Volcano, seeing lots of Apapane, House Finches, and a few Northern Cardinals. We also heard our first Hwamei (Melodious Laughing Thrush) of the trip, though in typical fashion it failed to materialize from its forested haunts. The rest of our day was taken up with travel, as we caught our flights to Kauai – the second island in our Hawaiian adventure. We did manage to sneak in a little birding during a stopover in Honolulu, hanging out in the airport’s Japanese garden where we saw our first Red-vented and Red-whiskered Bulbuls (including a brand new fledgling of the latter). This entry was posted in Birding Tours, Birding Trips, Hawaii and tagged Big Island, birds, Eagle Eye Tours, Hawaii, honeycreepers, nature tours, Photography, Tours. Bookmark the permalink. I loved your blog! We just returned from a trip to Maui. We had seen a small brown bird there, which at the time I thought looked like a thrush. However I was unable to identify it from any of my birding apps or other internet searches. Now I see that it looked a lot like the Omao pictured in your blog, and the size is about right as well. They were right down by the shore though, picking something off the rocks, which doesn’t really fit the description of where Omao are typically found. Could that possibly be the bird that we saw? Hi Robin! Maui is fantastic! Jody (the other guide) and I spent 1.5 days there after the tour ended … maybe I’ll do a blog post on those few days soon. Hard to believe it has been a year since my visit! 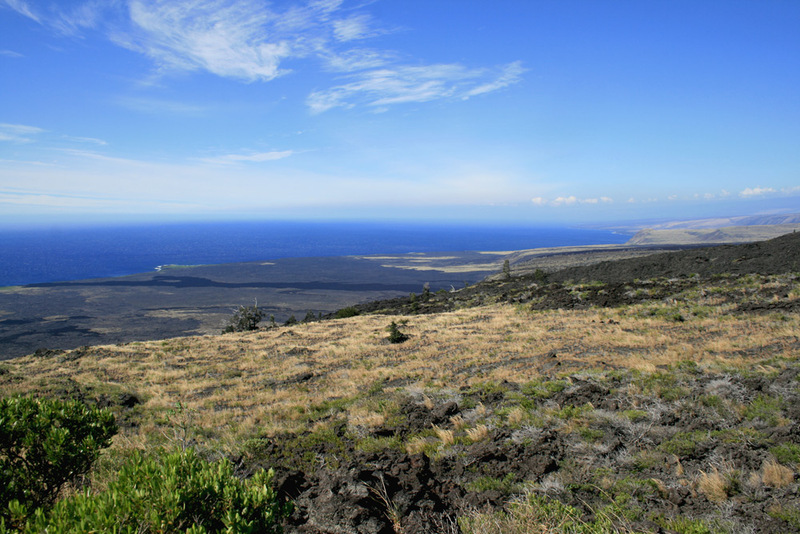 Omao is endemic to Big Island and does not normally occur in Maui, so it’s not likely the one you saw. And as you mentioned, the habitat is wrong. In fact, as sea level like that thee are very few if any native songbirds left — most are “extinct” below the altitude of ~4500′ due to avian malaria carried by mosquitoes! Could your bird have been a shorebird? Maybe Wandering Tattler, which is a dumpy grey bird that fits the behaviour you described. Or maybe one of the introduced songbirds? There are many introduce songbirds in Hawaii. Sorry I can’t be of more help without a photo or more details. But glad you enjoyed your visit!